Each of the recommended links below will open a new browser window. Operation Green Leaves, http://oglhaiti.com dedicated to reforestation in the context of economic development. FAVA/CA, Florida Association of Voluntary Agencies for Caribbean Action, http://favaca.org provides seed money travel grants. Seven principles are self-help, short-term, small-scale, cost-efficient, on time, high impact, and accountable. 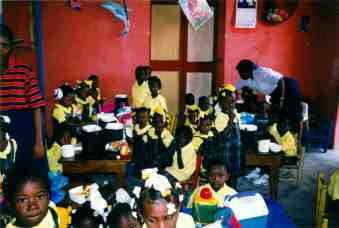 Agape Flights, http://agapeflights.com Christian pilots provide regular weekly flights for mail and transport of missionary volunteers to Haiti. DOA/BN Haiti Travels, http://www.geocities.com/haitiantravelers/index.html DOA/BN (pronounced DWA-BAY-N in Kreyol) is a private business providing historical and cultural seminars and guided tours since 1992 throughout Haiti's nine departments. 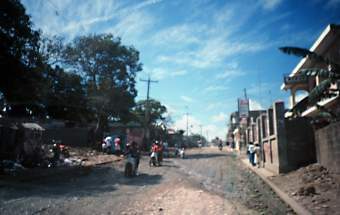 Haiti Support Group, http://haitisupport.gn.apc.org/ Justice, human rights, and participatory democracy support group based in London, England, United Kingdom. Organization for the Rehabilitation of the Environment, http://oreworld.org is working to improve environmental, agricultural and economic conditions in rural Haiti, involving high revenue tree crops, improved seeds, cash crops and marketing programs. Quisqueya Christian School Contact Center, http://digitalcrossroads.tripod.com/contactcenter/ Names, email addresses, phone numbers, and locations for many former QCS students. Also, a discussion board. USAID/Haiti, The United States Agency for International Development Haiti Mission, http://www.usaid.gov/ht/ provides development help for hillside agriculture, micro-credit, health, education, and support for electoral processes. Bob Corbett's Haiti Pages, http://www.webster.edu/~corbetre/haiti/haiti.html Book lists and reviews, history, culture including Voodoo, film, art music, and information on People to People, Inc. Bob Corbett, of Webster University's Philosophy Department, has visited Haiti some 40 times since 1983 and runs a mailing list on Haiti and he founded the group People To People, Inc.
and developed in collaboration with the Office of Instructional Resources. course, and a treasure trove of letters and essays on the cultural and political history of Haiti. Pro bono web pages courtesy of Haines Brown and Hartford Web Publishing. The Temple of Yehwe, http://www.vodou.org a little slow and may crash some browers such as Netsacpe. Information on Vodoun, the African presence in the New World, gorgeous photos and music, index of scientific names and Kreyol names for medicinal plants. Very inspirational. Windows on Haiti, http://windowsonhaiti.com An nou koupe t�t enjistis, boule kay la miz�, so in the year 2004, Toussaint, Dessalines, Christophe, P�tion, Capois, and all of the heroes and heroines who made 1804 a reality look down on us and see that they did not struggle in vain. Don't miss the various forums, e.g. ann pale and let's talk and Patrice Backer's "Does Haiti Need A Structural Adjustment?" This site is very rich in literary art, passion, and everything about the love of Haiti. Some pages do not display in Netscape. The Panos Institute http://www.panosinst.org International organization works to strengthen civil societies by helping journalists cover sustainable development issues that are overlooked or misunderstood. Haiti Online, http://www.haitionline.com - inactive, "in hibernation." CDC Centers for Disease Control http://www.bbc.co.uk/caribbean/ Health Information for Travelers to Caribbean tells what to watch out for. UN (United Nations) map of Haiti http://www.un.org/Depts/Cartographic/map/profile/haiti.pdf This is a good big PDF map. Make sure you have the Adobe Reader. Trinity College of Washington, D.C. Haiti Project.